Willie Mae (Moore) Smith, age 81, was born February 14, 1938 in Memphis, TN to the late William Moore and Nancy Vick. Willie Mae took her wings on April 10, 2019; passing peacefully at OSU Wexner Hospice. She was preceded in death by her grandparents William and Kizzie Vick, brothers James Moore and Edward Sesley, and a bonus mother and father George and Lizzie Kibble, who helped raise her. 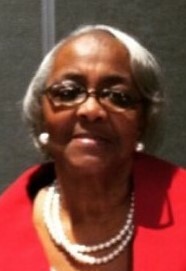 She was along-time member of Refuge Missionary Baptist church where she served in the Deaconess Ministry; Trustee Board; Superintendent of the Sunday School; Seniors Ministry; Food Pantry Ministry; and a member of the choir. Affectionately known as “Memaw”; Aunt Mae; as well as, Mother Smith; she was a warrior for the kingdom of God! She had an on-fire attitude for His Word and His Will! She seemed to never meet a stranger, loving everybody she met and always wanting to help when she could. Her selflessness captured the hearts of many! Willie Mae worked for the Defense Department for 30 years and took great pride in her work. She loved her family so much! Her grandchildren were the joy of her life and she always reminded us of this by telling us “Don’t mess with my grandchildren!” and she meant it! Willie Mae leaves to cherish her memory: Floyd D Smith, her husband of 56 years; Daughters: Sherrill (Richard) Hodnett and Veronica (Kenneth) Clark; granddaughter Sherettha (Robert) Simmons; grandson Ja’Chi Clark; and great-grandson Jaden Holliman. Sisters, Dorothy Mae Hardaway; Barbara Vick Walker; Hazel Moore; Rita Moore; Gwendolyn Harper; Evelyn Sesley; and brother Herbert (Jan)Moore. Bonus daughters Kimberly Jennings and Teresa Rembert; Special nephew-in-law Kevin (Jo) Clark and a host of additional nieces , nephews, cousins and friends. Family will receive friends Wednesday, April 17, 2019 at 10am until time of service 11am at Refuge Missionary Baptist Church, 400 N. 20th St., Cols, OH 43203. Interment Glen Rest Memorial Estates. Arrangements by WHITE’S FUNERAL AND CREMATION SERVICES, 867 S. JAMES ROAD, COLS, OH 43227, BENJAMIN F. “BENNY” WHITE, JR, FUNERAL DIRECTOR, (614)947-1123, whitesfh867.com.